You are here: Home / Kitty Wisdom / Intoxicating Kitty Story on Catster! Intoxicating Kitty Story on Catster! My human’s first story on Catster is up — on fun highs for us kitties! Check it out here: http://www.catster.com/lifestyle/cat-behavior-tips-humor-stoned-totally-legal – and let me know what you think! but have never tried any. We will get our Mom to check out some of these things. We really enjoyed your Human’s article on Catster, Sparkle! And we really need to try the ‘vine! Me and mum enjoyed your article. I like anything that gets me high, but silver vine is my favourite. That is SO exciting! ConCATulations to your human, Sparkle. We will go and read her article now! Great article! I really like your writing style. I am one of those cat owners that has 2 out 3 cats that have no interest in catnip so I’m excited to hear of the options. Excellent article by your human. Purrs to her. Our Mom learned something today. Super article, I had no idea about honeysuckle!!!! Never heard about Honeysuckle wood ! Grreat article your mom have wrote on Catster ! Honeysuckle wood?!? We must check it out! That was pretty cool. Sparkle! We didn’t know about the honey suckle, that’s one we will have to try out. Our first cat loved stinky socks, and the riper they were, the better she liked them. In a pinch, she’d settle for undies. She spent all night dragging them around the house, calling like she was calling kittens all the while, and it was a hunt in the morning, trying to find everything. VERY cool! I didn’t realize how many things got the cat high! Well…other than visitor’s shoes–my Grace is forever rolling all over everyone’s shoes at the front door. I’m not asking…I just let her go to town! That was a fun article Sparkle, bit now I’ve got the munchies! Oh we are off to read about it right now! Whoa! Concats. I’m heading over there now. Great article and very informative! Loved your stinky face sniffing the valerian Sparkle! Loved the photos of youse guys! 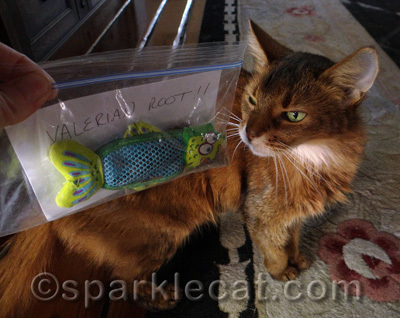 We definitely prefer Silvervine (matatabi) to Catnip! Alright sweet Sparkle! I’ll go. COOL! We’re so glad she’s writing for them!